YRF’s Thumping Track Swag Se Swagat from the Salman Khan-Katrina Kaif starrer Tiger Zinda Hai certainly has online swag! So much so that the song just hit a major milestone and created a new YouTube record. 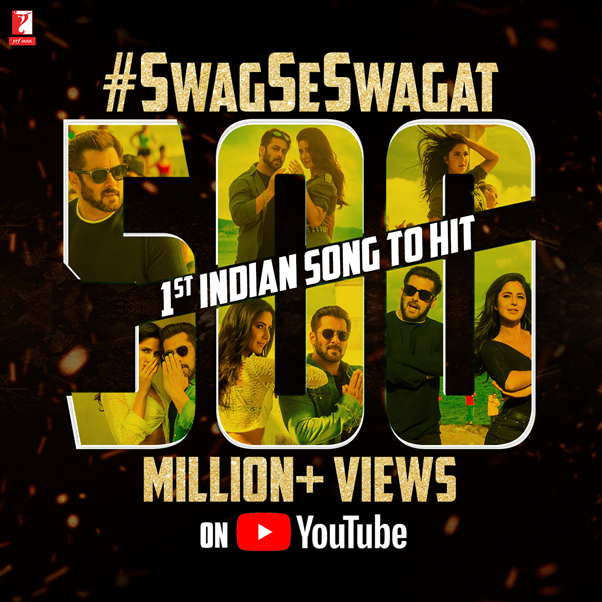 Sung magically by Vishal Dadlani and Neha Bhasin, with a supercool video of Salman, Katrina and dancers from across the world swaying to its beats, ‘Swag Se Swagat’ has been setting new records online ever since its release. The song became the Fastest Bollywood Song ever to clock 200 million, 300 million and 400 million views on YouTube, growing in popularity with listeners worldwide rapidly. 15 queries in 0.390 seconds.